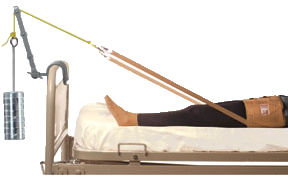 Pelvic Traction is often used to alleviate low back pain, as well as hip and leg pain associated with some lower back disorder. It helps achieve proper alignment of the lower vertebrae as well as reduce muscle spasms. It decreases herniation and reduces the compression in the spinal column, releasing trapped nerves, thus relieving pain. This kit contains traction water and sand weight bag, Hsq traction pulley bracket, the pelvic traction belt and traction cord. Everything you need to be well on your way to recovery.